On the one hand, Lutz Dammbeck made a number of films in the state's studios of the GDR, but he also worked systematically on the concept of a 'parallel cinema', which operated quite independent of all the censors stipulations regarding content and form. These two facets of his work have now been brought together in this publication. Bringing them together in this way reveals mutual permeation, but also indicates above all an emancipative continuity that points beyond the contradiction between state art and subculture. It is only logical, therefore, that the publication also includes films that were begun in the GDR, but only realised after Dammbeck's emigration from Leipzig to Hamburg in 1986. The inclusion of fragments can almost be considered more important; these explode the traditional concept of film. 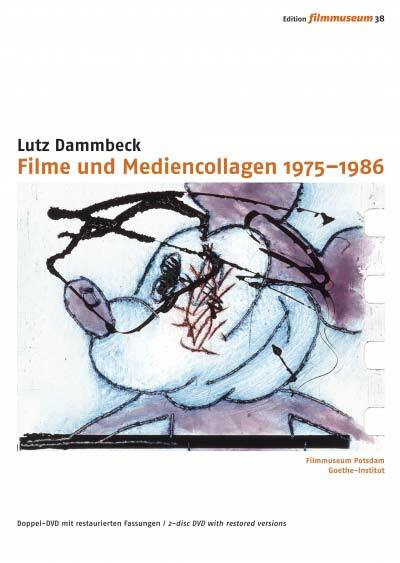 Only by including in the DVD release some rare recordings of his media collages, including test recordings, is it possible to even suppose the intention of Dammbeck's overall concept. The artist began to focus on moving images at an early stage. In 1972, when he completed his course at the 'College of Graphic Art and Book Design' in Leipzig, an animation-scenario already represented a part of his diploma piece. Although he worked successfully as a poster designer only a little later (and received several awards for this work), his primary interest was in intermedia working methods. This corresponded with his own impulse to extend the two-dimensionality of the classic panel picture into free space. Filmmaking became a concrete experience when he was able to realise his first filmic work on 35mm; The Moon made at the DEFA in 1975. Three years later, he advanced to the experienced utopia by making his privately produced, experimental film Metamorphoses 1. From then onwards, Dammbeck worked on two parallel tracks in his cinematic oeuvre, and he touched the limits in both fields. Under latent censorship of content and aesthetics at the DEFA , and under the rather provisional technical conditions of artistic autonomy. In an almost exemplary way, Dammbecks career demonstrates the restrictions inevitably experienced by a filmmaker and artist with considerable talent, active in many fields, when attempting to balance artistic pretensions and social reality in East Germany. 20 page booklet with essays by Fred Gehler, Claus Loser, Barbel Dalichow and Ralf Foster. Posters designed by Lutz Dammbeck 1977-1986. Texts, documents and drawings by Lutz Dammbeck as ROM features.